I was definitely skipping class when Shimano introduced its splined Octalink cranksets and bottom brackets back in 1996. 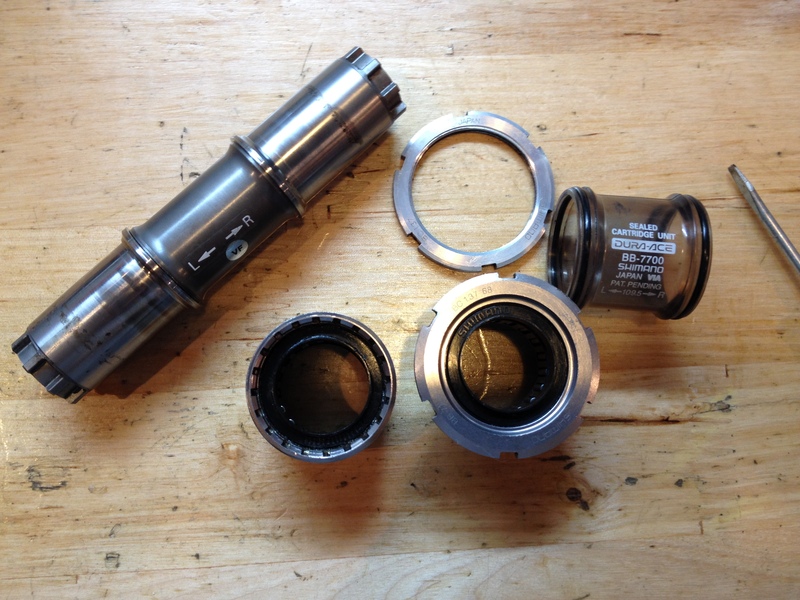 Since I have always been a fan of square taper bottom brackets, I saw no need to trouble my mind with this “new” system, a system which Shimano has long since replaced with outboard bearings and a right side crank arm with an integrated spindle. The Octalink design was meant to supply a better attachment to the crank arms. But, with this shallow V1 model, it is unlikely that Shimano achieved its objective. The V2 model has much longer splines, and its ISIS competitor, even longer. So, I was planning on selling this BB along with its mate – a very nice Dura Ace crankset that I took off an abandoned titanium triathlon bike, a bike which had seen some use, and then neglect. I wanted to take a look at the BB to make sure it was in good shape. I was assuming that, due to its sealed cartridge mechanism, an overhaul, if needed, would be impossible. I was wrong! When I removed the rings from the spindle I saw that they housed two sets of bearings on each side – a set of needle bearings to contact the spindle and a set of ball bearings to contact the spindle’s race. Both rings are supplied with two outer seals. The outmost seal is easy to remove – it just falls off the spindle, but the inner seal can be left in place while doing an overhaul, since your work will be done from the inside of the rings. View of ring from the outside, with first seal removed and 2nd seal in place. View of ring from the inside. 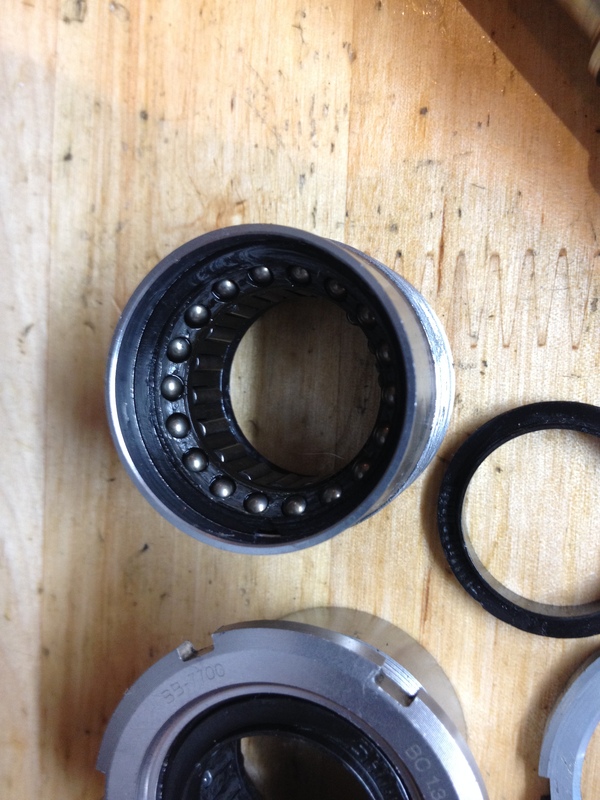 You can see both sets of bearings. Lock ring removed from inside of ring. 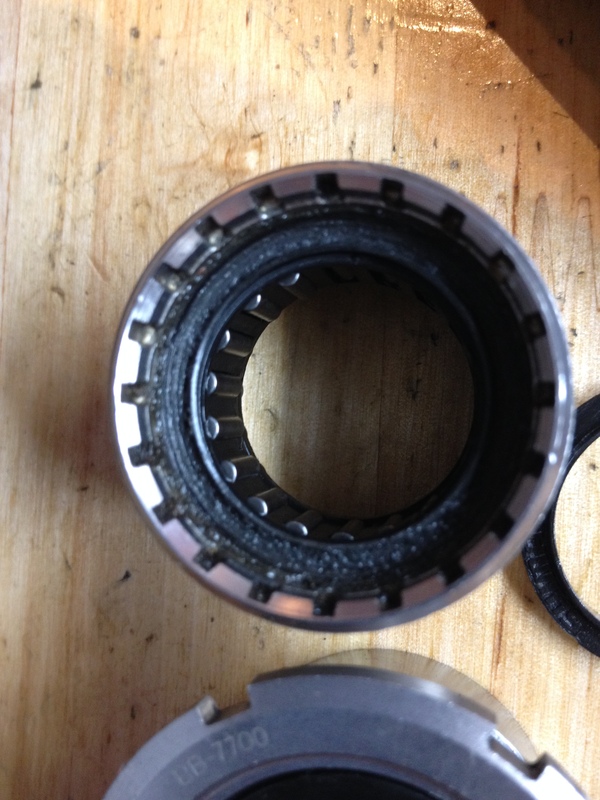 Peering down into the inside of the rings, you can see a lockring which needs to be removed to access the bearings. This is easily done with the tip of a small screwdriver. 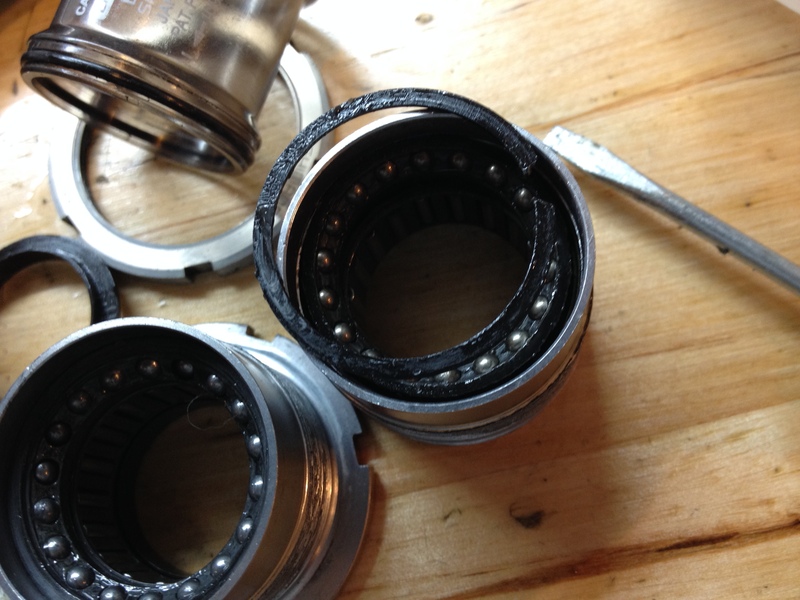 Then, you have access to the bearings and can remove them. Before doing so you should note that Shimano’s own technical specs for this BB do not provide instructions on how to do so, but just a schematic of the parts. When you remove the bearings, do not do what I just did! I was unprepared for the bearings to simply fall out of their clips (causing a PTSD experience reminiscent of recent freewheel overhaul mishaps). The needle bearings and ball bearings went for a little journey around my work bench. I was most concerned about the needle bearings, as I didn’t have replacements for those, and was planning to replace the 1/8″ ball bearings anyway. 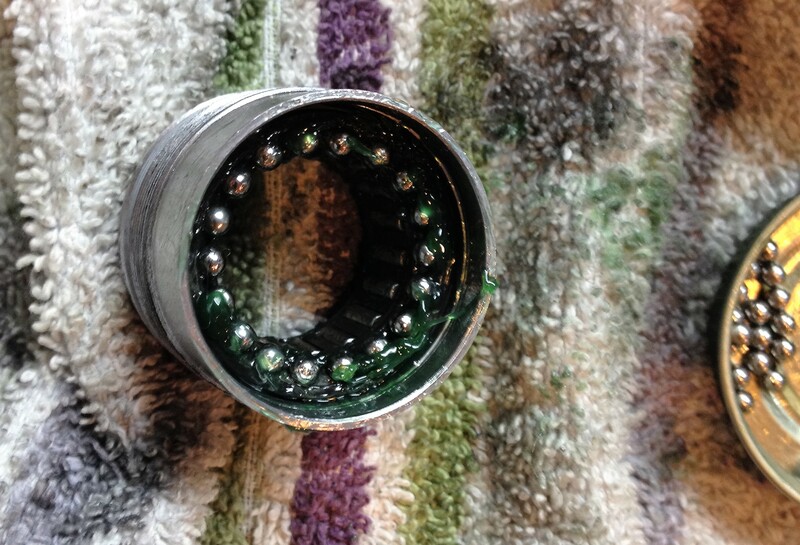 Fortunately, I recovered the bearings with my magnet, but while doing so I pondered why Shimano would think it would be acceptable to use such tiny bearings in a bottom bracket. 1/8″? Really? Apparently, the needle bearings take the load off, literally, from the tiny 1/8″ ball bearings, so things are not as bad as they may seem. 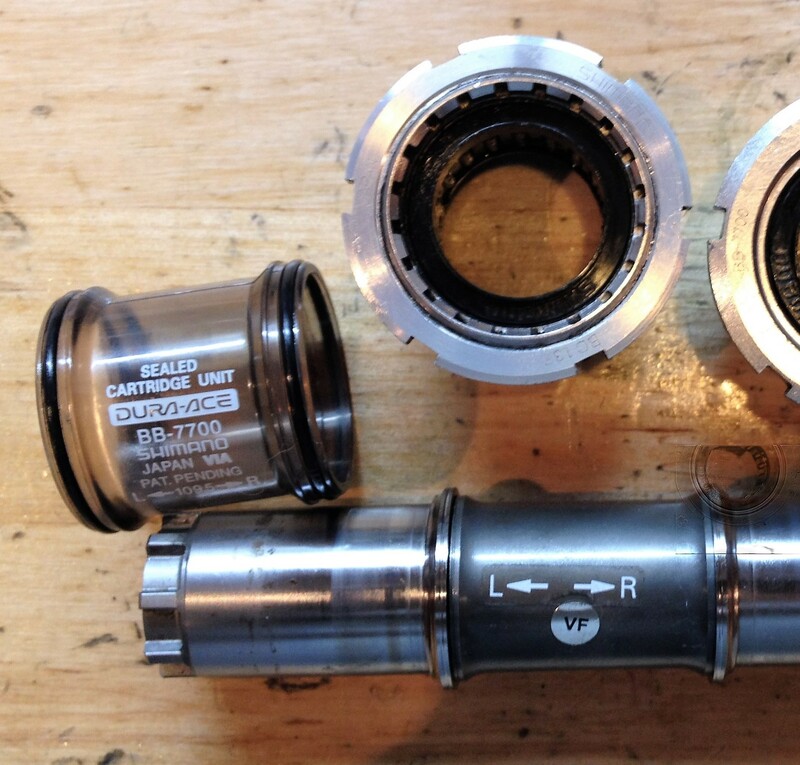 I don’t know about the general reliability of Shimano Octalink bottom brackets, but Shimano’s cartridge bearing square tape BB’s use much larger bearings, although the non drive side bearings are typically smaller that those on the drive side. 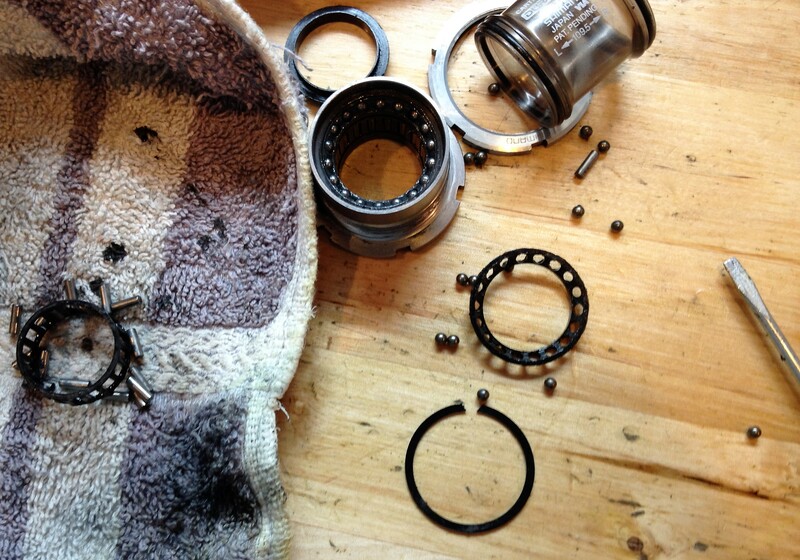 Once I had the bearings back into their flimsy clips I added grease to the cup. It was a bit of trial and error getting the bearings back in. I found it best to grease the clips heavily, then install the bearings. The needle bearings go in easily. 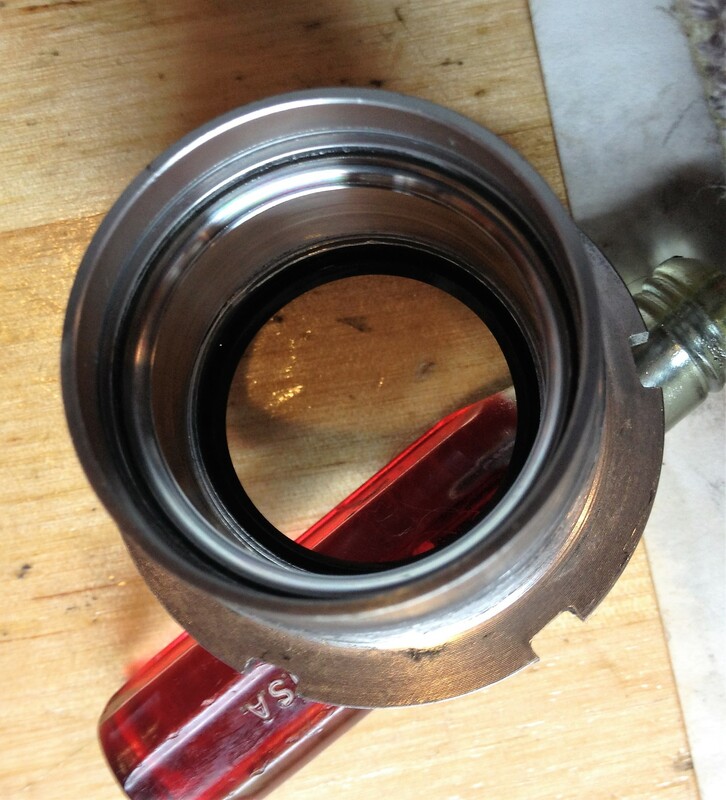 For the small 1/8″ bearings which come last, it was necessary to turn the cup over and gently place the ring over the bearing clip. Otherwise, the bearings just wanted to fall out of the clip (as they are inserted from the outside of the clip). Once in place, I re-installed the lock ring and tried the rings out on the spindle to test their smoothness. All was good – they were once again smooth as glass. Park Tool’s service guidance for these bottom brackets states that “it is recommended to leave the needle bearing and ball bearings in the cup” and that the ring should simply be flushed with solvent and re-greased. That might be okay if there isn’t a lot of debris inside the rings. I’m glad I removed the bearings, as it gave me a chance to evaluate the rings, and to take a close look at how the mechanism is meant to work. 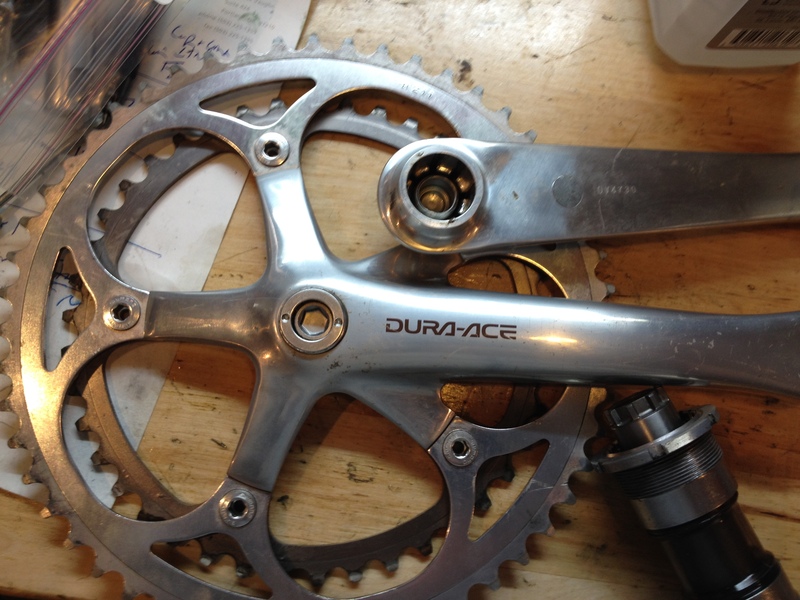 And, if you have been looking for a Dura Ace Octalink BB and Crankset, those items will be for sale on eBay soon. 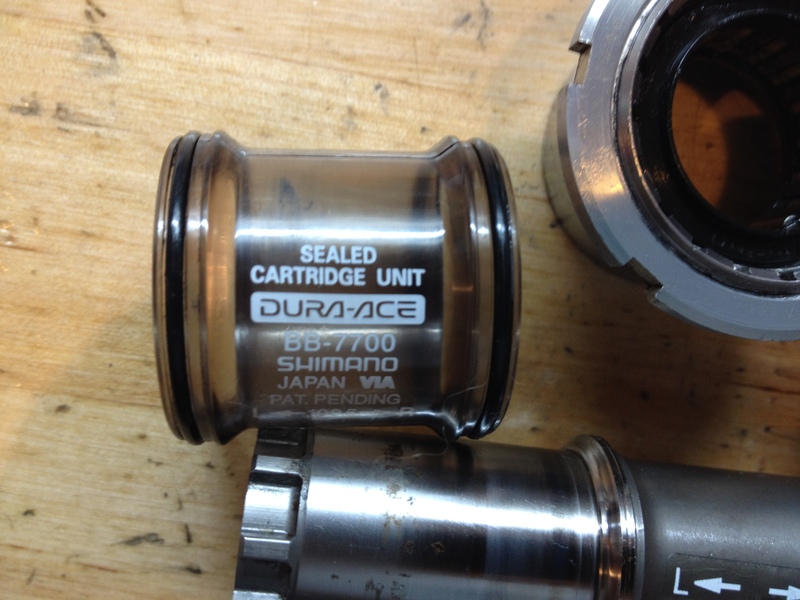 This entry was posted in Bicycle restoration and tagged Dura Ace, Octalink, Shimano bottom bracket by Nola Wilken. Bookmark the permalink. 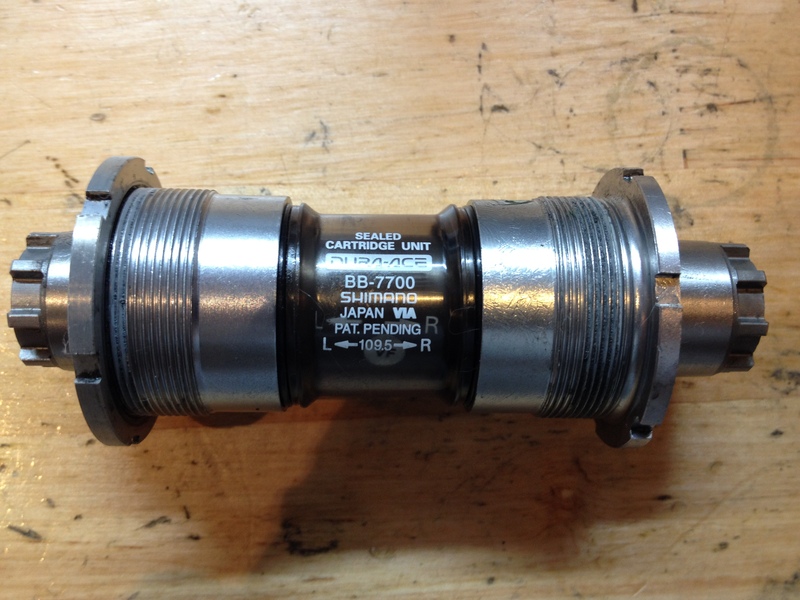 Older Shimano components are very nice. I also use newer Shimano derailleurs which work fine with vintage shifters. I think one huge mistake was attempting to control the marketplace with proprietary systems. The marketplace fought back! Sure makes sense to sell the cranks with the BB. It’s getting tricky to find replacement Octalink compatible cranks. Not such a terrible loss though really. Since both the crankset and BB are in great shape it seems logical to sell them together. The fact that the BB is adjustable is appealing. Haven’t decided if I might keep this set around for some future project. We’ll see. I believe that ball bearings are manufactured with a desire to escape and roll into a nook or cranny where they cannot be found, I put a Park tool magnetized bowl in my online shopping cart once just to bump it up to free shipping and then found it invaluable when working on bearings, there is always a sense of drama when I am taking apart a headset on a bike boom 10 speed..will the bearings be caged or loose and will I lose any…?